STATE RD 200 FRONTAGE COMMERICAL PROPERTY. 1 unit with option 16 x 23 garage for $50.00 more per month. 1 restroom. Tin roof, paved parking, lot is accessible from the rear on Tomahawk Terrace. Building is vacant, used to be 2 offices and a beauty salon. 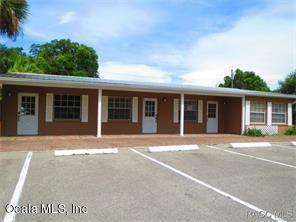 Beauty shop approximately 484 sq ft available for only $350.00 per month. Sales tax is charged on all rentals. Broker/owner. Listing provided courtesy of Dixie Parsley of Parsley Real Estate, Inc..